I am excited to finally share this project! 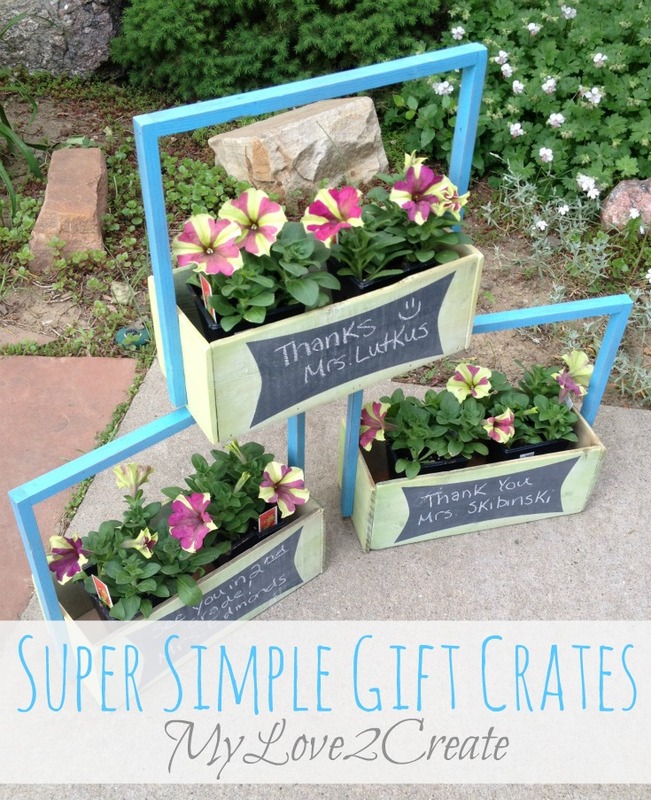 It has been almost a month since I made these super simple gift crates for my kids teachers. Anyway, I am on the rise so... I thought I will share these fun crates with you! 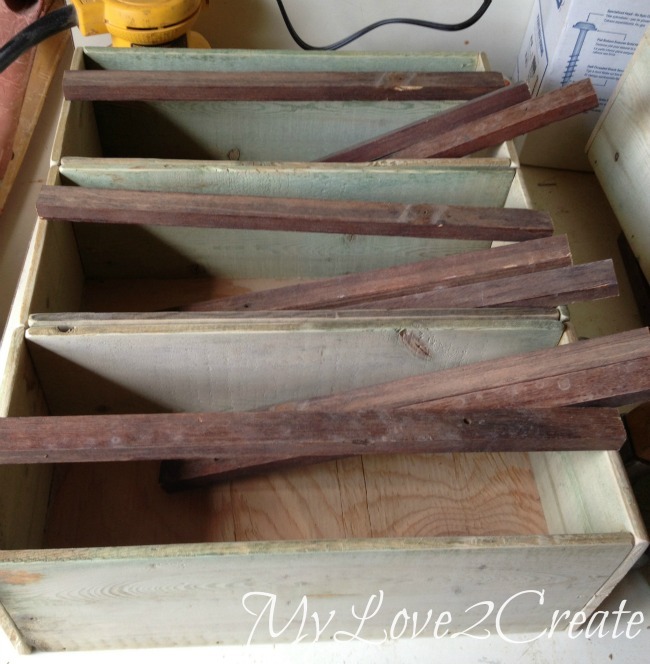 Most of you know I am a lover of crates and one of the reasons is because they make a fun and useful gift. You may remember my Reclaiming blinds to use on Teacher Gifts that I made last year. I wanted to try something different this year. 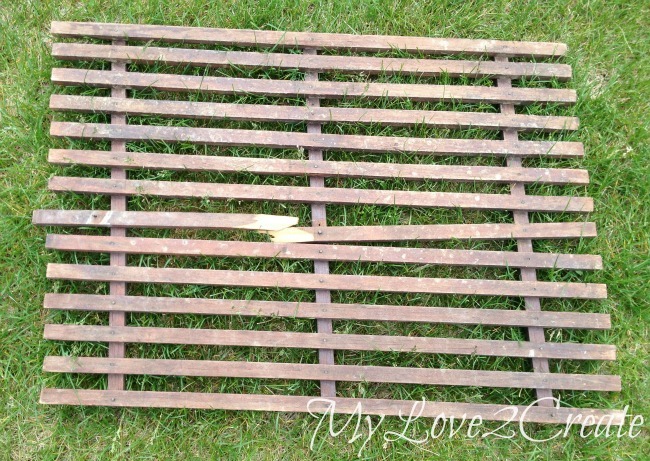 I had this old wooden door mat for a long time, that I had picked up for free. I knew the wood would come in handy someday....and it was perfect for the handles for these crates. I simply pried them off with a crow bar, the nails popped out easily. I made three crates/boxes out of some awesome free wood I had gotten from and old nursery in Boulder. It had a faded green color and was a great thickness for crate making, I am sure you will see more from this wood in the future, I grabbed a TON! I also have all the wood for my handles cut and ready. For the bottoms I used scrap plywood. 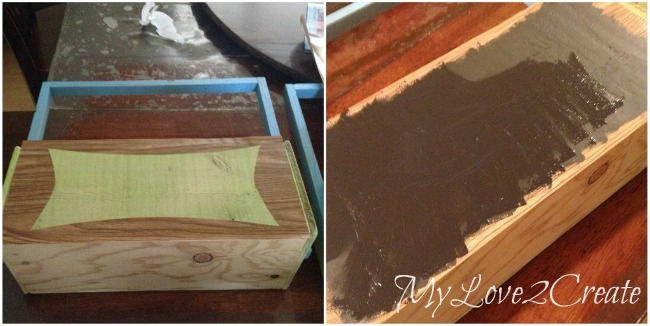 If you need a quick tutorial for how I made the crate/box you can follow my DIY Chalk Box Tutorial it is really simple and the only difference is that I used glue and my nail gun (instead of clamps), but either way works! 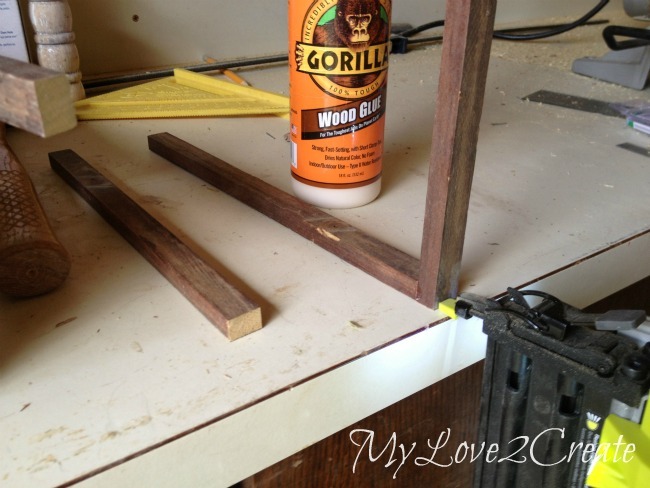 Using my awesome gorilla wood glue and Ryobi nail gun I glued and nailed my handle pieces together. I used about three nails in each end. 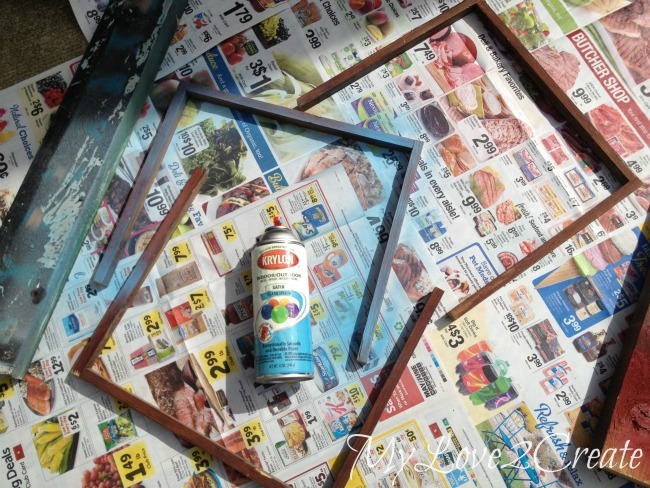 Then using some left over spray paint I gave the handles a quick coat of Krylon's Island splash. 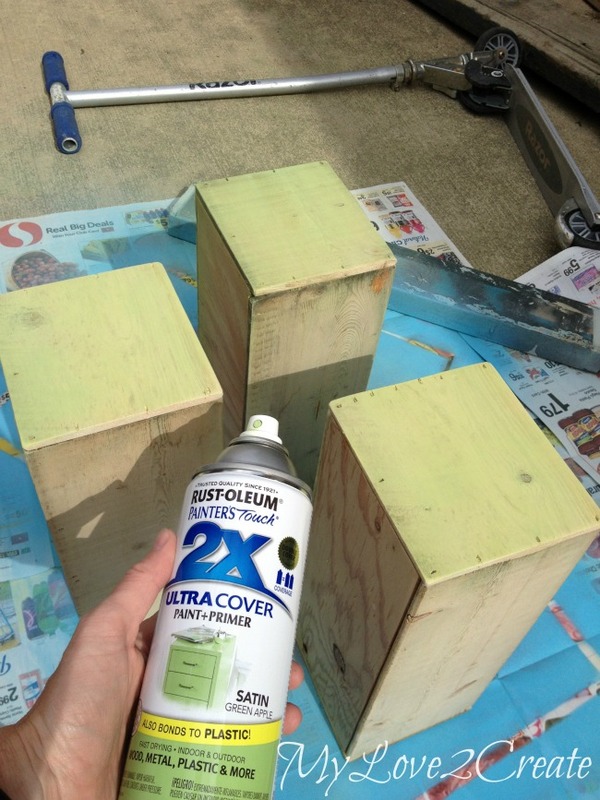 I also used some left over Satin Green Apple from Rust-oleum to lightly coat the outsides of the crate. I did this so you could still see the wood grain, it was a very quick light coat, I wanted it to look a little faded and rustic. Then I glued and nailed on the handles. I used a scrap piece of wood to set the handle on so they were in the same place on both sides. Since I am a sucker for chalkboard labels I had to add one to each crate! I cut out a label on my cricut (if you don't have a cutting machine just use painter's tape!) with contact paper and painted three coats of chalkboard paint. I always remove my stencil as soon as I finish painting the last coat, while the paint is wet. I primed the chalkboard surface by rubbing it with chalk and then erasing it. And I was done! I also distressed the handles a little on the edges. 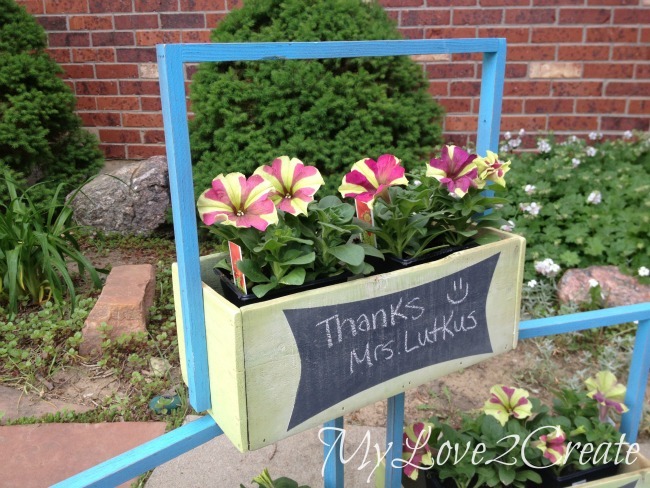 The flowers are great because the teachers can plant them and enjoy them all summer. 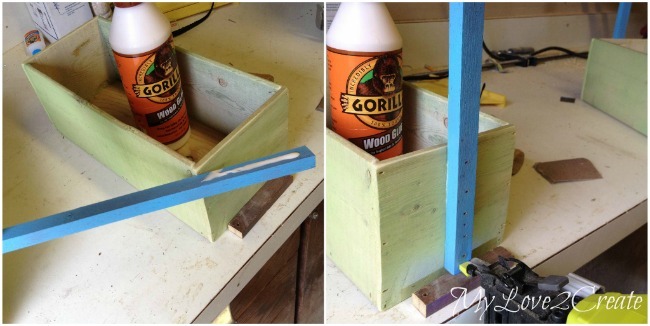 The crate will be perfect for the classroom or at home in any room! The best part about these crates is that you can make them for any occasion, birthdays, showers, weddings...you name it! Who doesn't love cute storage?! For more gift crate ideas visit My Projects. you know what I love most about these? that you made that chalkboard such a fun shape! I think it really makes the project awesome! I've said it before and I'll say it again, you are the crate QUEEN! You are so clever! I totally wish you were my visiting teacher. Glad to know you're feeling better now, stomach bugs are a pain! 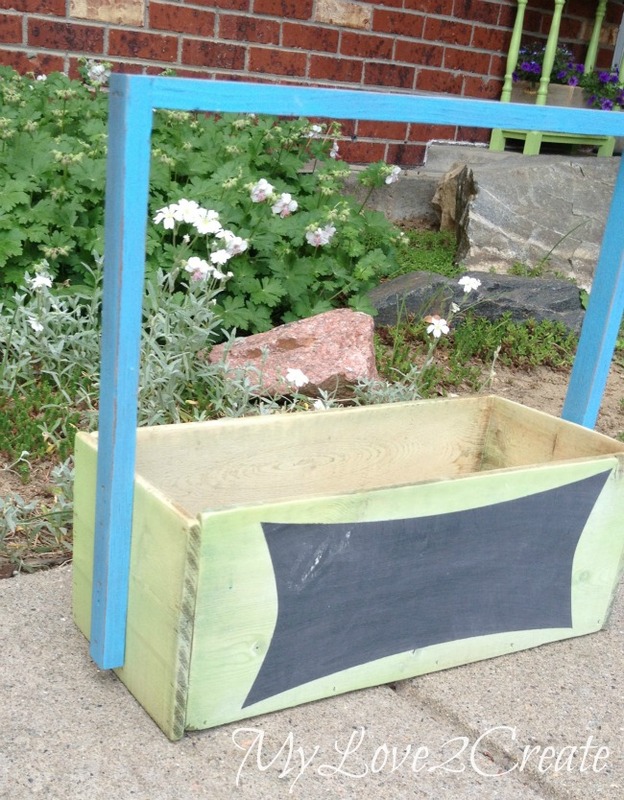 I love the crates, the long handles and chalkboard designs are cute! Hi I found your beautiful gift crafts at a linky party. Wanted to let you know I'll be following you from now on and can't wait to see what else you create! These are awesome!! So great! What creativity and beauty you create. Can't wait to see what else you make!! Great idea! I pinned to my gift ideas board! Your crates are awesome! I love how you totally built them from scraps and pieces you already had around. Thanks for sharing your creativity! Love these!! A really great idea!! Great project! I love re-purposing old things and making them into new things! Great Job! I love your crates! They are so cute! Pinning! Pinning this. Your friends are lucky to get such great gifts! These are adorable! I love the chalkboard on the fronts. Thanks for sharing at The Makers! Love these! Definitely pinning for later. We'd love to have you link up for Adventures in Pinterest this month! Glad you're feeling better Mindi. These crates are so pretty! I love the colors you chose, and how you always manage to create beautiful and useful things from your scrap pile! So super creative and cute. Awesome upcycle. Hi Mindi! I'm visiting from Selene's blog. 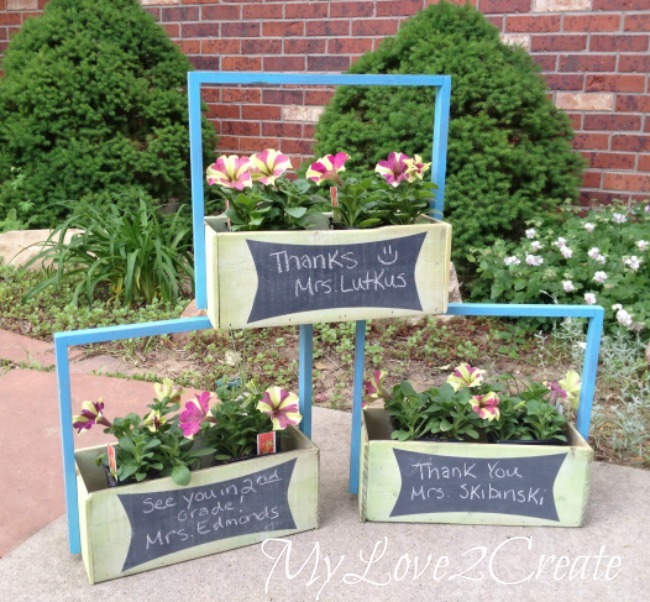 What a great idea for a teacher's gift! I love the rustic look too. Those crates could have many uses around the home or in the classroom. Great idea!